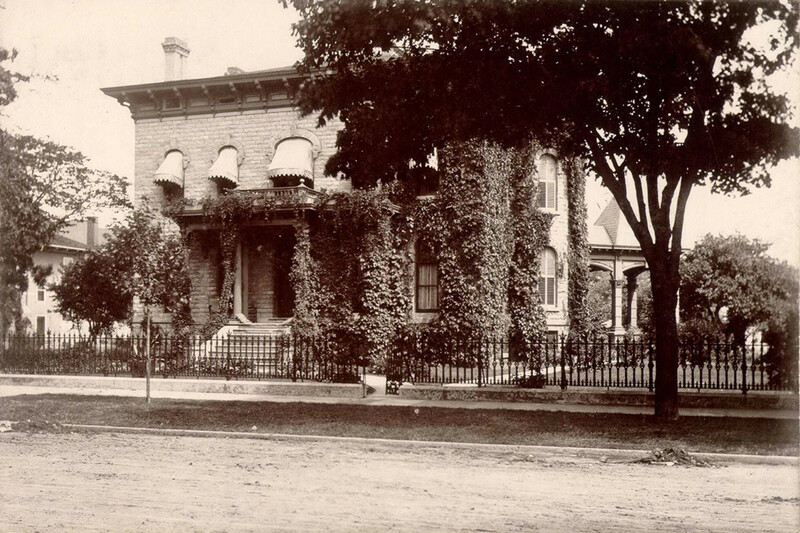 The building at 414 Wayne Street was originally built as the home of Mr. and Mrs. Jay O. Moss in 1872. A portion of the lot was a gift to the couple from Jay’s father, banker A.H. Moss. The remainder of the property was purchased from Oran Follett, who lived nearby at the southeast corner of Wayne and Adams Streets. Born in Sandusky in1838, Moss served as paymaster at the prison for Confederate officers on Johnson’s Island, without payment, until the end of the Civil War. He then joined his father, A.H. Moss in the banking business, subsequently becoming president of the Moss National Bank, a position he held until the business was liquidated. 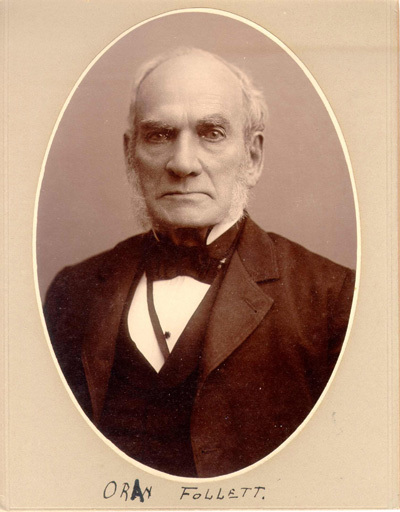 In addition to his banking interests, Moss was president of the Sandusky, Mansfield and Newark Railroad in the early 1870s and later was associated with the Sandusky Street Railway. He died in 1911. The Martha Pitkin Chapter of the Daughters of the American Revolution was organized at the Moss home in 1897. In 1899 Mrs. Jay O. (Frances) Moss, who was acquainted with Andrew Carnegie, helped to secure a generous donation from Mr. Carnegie towards the building of the Sandusky Library. The Italianate-style mansion is built from limestone with wood trim. It features an off center porch, wide flaring eaves and brackets, and cut stone window trim. An unusual feature is the carriage porch on the south side that includes foliated pillars and a polygonal roof. The family and visitors used the porch as they disembarked from carriages. The coach house, where the horses and carriages were kept is located just behind the house. Herbert Farrell, Sr., president of the Farrell-Cheek Foundry, purchased the home in 1917. The Sandusky Business Women’s Club bought the property in 1926, with financial assistance from the Women’s Building and Restroom Association. The property was maintained by rent from five apartments, the coach house, and from civic club meetings, service groups, wedding receptions and dinners. In September of 1927, a local physician, Dr. Paul Squire, invited a group of Sandusky men and women interested in the advancement of culture to a meeting in McKittrick’s Tea Room on East Adams Street. From that meeting originated an organization that has entertained our area for more than three-quarters of a century: Harlequins Community Theatre. In the beginning, Harlequins had no permanent home. Performances were held in churches, a warehouse, an attic and several local schools. Finally, Harlequins arrived at its present home, the coach house of the Moss mansion at 414 Wayne Street. The intimate, 97-seat space was first leased as a work area in 1940 with the first production staged there in 1958. Before that first show, however, Harlequins members removed the horse stalls, laid a concrete floor, erected an addition to provide the stage area, and converted the loft into a green room and storage space for costumes and properties. The Business Women’s Club sold the house to the Harlequin’s Theatre at a loss, with the stipulation that they continue its use for civic purposes for at least three years. At the end of this period Harlequins sold the house to George Gilbert, who converted the building for use as apartments. The Harlequins secured a 99-year lease on the former carriage house for use in the group’s theatrical productions. Since 1984 the former Moss home has housed offices for several Sandusky attorneys.